The pattern calls for 4 balls and I only used a few metres from the fourth ball! Very annoying. 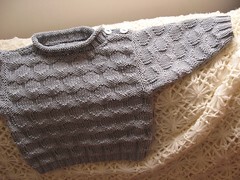 It was a lovely knit and I was very pleased with how the half circles joined at the side seams to look continuous. Although, I did find it difficult when it came to the buttons. 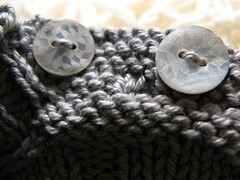 The yarn has such a sheen to it that it seems to call out for mother-of-pearl buttons. I had originally wanted to put on some handmade wooden toggles (from the button lady in the Apple Market at Covent Garden), but they were too big and not quite the right colour. I hope these don’t look too girly for the wee man!